eight − 7 = Required Please enter the correct value. "Individuals deposit money in banks instead of stuffing it in their mattresses because they believe that their money will be safe there," explained Fitz-Gerald. "Once they realize, or even suspect, that the money they put in the bank is anything but safe, they will take whatever's left and run – and the bank will collapse in spite of the "bailout.'" 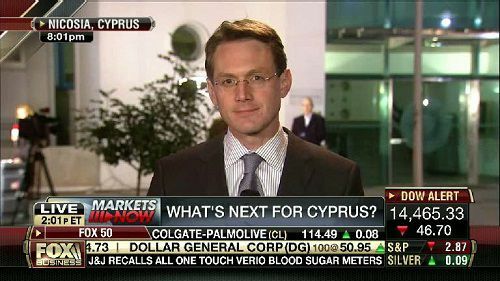 To get an idea of what life on the ground in Cyprus is really like right now, Fitz-Gerald recently caught up with FOX Business Network's Washington Correspondent Rich Edson. Edson has been reporting from Cyprus as the controversial bailout plan unfolds. Here's how Edson explained the scene in Cyprus. Money Morning's Keith Fitz-Gerald: Rich, please tell us how the everyday man is reacting to the news that accounts are covered, but that cash may be extremely limited? FOX Business Network's Rich Edson: The problems are concentrated in the two largest banks. Most of the folks we talked to are relieved their deposits are safe, but are concerned about what it means for the economy. Banking is a massive component of their economy. That is now shrinking. This country is in a recession and it appears it will now get worse. Fitz-Gerald: Wealthy Cypriots are going to get a haircut on their accounts above the insured level – but are there any of these account holders left in the country? I've heard from my circles that the truly wealthy bolted with their accounts at the first whisper of this bailout plan. If that's true, will the levy really raise the amounts the European Union thinks – and requires? Edson: The EU is expecting 4.2 billion euros ($5.2 billion); they are going through the books now. There is a significant expat and Russian community here, and given the Russian reaction, it appears that community is losing a significant amount of money. Fitz-Gerald: Do you as a foreigner feel safe, or have Cypriots transferred their anger to visitors? How are you paying for things you need on a daily basis? Edson: I have felt welcomed and safe. Cypriots have been more than willing to tell their stories, and in many cases, their businesses have accepted my American Express. Fitz-Gerald: Considering that the Cypriot financial sector is 45% of GDP, do regular Cypriot citizens truly understand the implications? For example, many Americans and Europeans don't understand the too-big-to-fail risks in their countries. They read about them but they just don't "get it." Edson: Oh, they get it here. When we got off the plane the airport was covered in financial services ads. Bank employees who are likely to lose their jobs have been protesting in front of parliament and very vocal. Plenty of folks we have spoken to understand the relief of having access to their bank accounts again and also the consequences of reducing such a dominant portion of the economy. For more coverage of the Cyprus bailout, check Keith Fitz-Gerald's recent analysis, Is the Latest Ultimatum in Cyprus About to Derail the Eurozone?